The ABBYY FineReader Engine OCR process consists of several steps, starting with importing images and ending with exporting the recognition results. The OCR developer kit can receive images from many sources. Text images saved as TIFFs, JPEGs, PDFs or other image formats can be imported while photographed text or scanned paper documents can be processed directly from the memory. To increase recognition accuracy, the image quality is enhanced during the pre-processing step. The SDK applies a wide range of imaging functions such as image rotation, binarization, de-skewing and others to optimize the image quality. With AI-based algorithms and ABBYY Adaptive Document Recognition Technology (ADRT®), the OCR toolkit analyzes the layout of each individual page as well as structure of the document as a whole. This process defines the areas for text recognition and delivers information about layout and formatting elements for the final document reconstruction at the end of the OCR process. With the highest accuracy, ABBYY FineReader Engine SDK extracts multilingual machine-printed and hand-printed text (OCR, ICR) as well as various other information including, checkmarks (OMR) and barcodes (OBR). By creating own dictionaries or recognition patterns, the developers can increase the recognition accuracy of specific languages, unusual characters or fonts. The OCR SDK offers many options for exporting recognition results and different levels of document layout reconstruction. Numerous storage formats are available: text, XML, different types of PDF and PDF/A formats, editable Microsoft® Office documents and other saving formats. 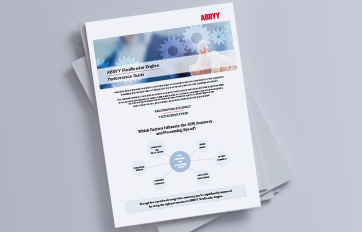 Learn how to optimize the recognition accuracy and processing speed in ABBYY FineReader Engine.